Rubber shoulder grips to help prevent garments slipping off. Ideal size for jumpers, cardigans, blouses, shirts, etc. Skirt loop/ strap hooks also on underside of arms. Bought these rubber-topped hangars instead of the notched variety to see if they worked and any better at stacking/storage than the notched ones. 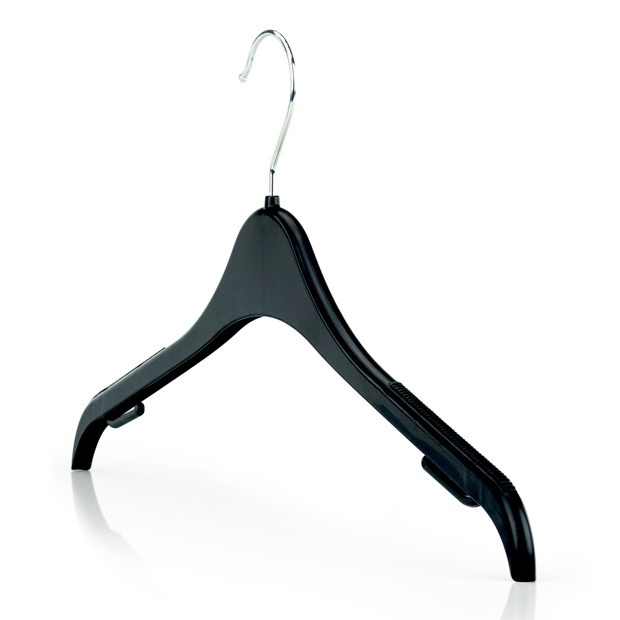 They are very robust hangars, well made and the rubberised outer ends hold strapped garments just as well as the notched ones, plus they don't all get tangled up when not in use (as no notches to catch). Great product, great price and very rapid delivery. Great shape hanger for all types of tops. The rubber along the top stops things slipping off, the curved ends means you don't get any pokes into the sleeves.and of course the extra bits under the hanger is good for scrappy tops. Delivery is always very prompt and even better because it's included in the price. Always liked those highstreet shops hangers and finally found them here. Speedy delivery too. Highly recommended! I purchased 50 hangers for my daughter to take to Uni. Great value and they are perfect. Ordering was easy, updates on the progress of my order were very welcome and delivery was extremely fast. I would not hesitate in ordering these hangers again and Hangerworld are 5 star.